I am a big fan of drinks that taste a bit like medicine. Pour some bitters, be they Angostura, orange, Campari, Aperol, Fernet, etc., into a glass of whiskey, gin or brandy, and chances are I’ll slurp it up. 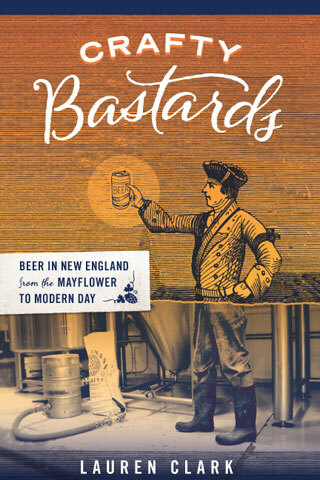 Bitter cocktails are, like blue cheese or anchovies, something we start out thinking is disgusting but that, as we get older and wiser, we grow to savor. Shake hard and double-strain into a chilled cocktail glass. A full ounce of Angostura modified with a bit of whiskey? That’s, like, 50 times the amount of these “non-potable” bitters that are usually measured by the dash. Nonetheless, I poted them. And surprisingly, the drink was potable. With the sweetness of the orgeat (almond syrup) and the sourness of the lemon juice, the deep-red potion tasted kind of like a really strong, and medicinal, Sweet Tart. The weirdest part of it was the white head that just sat atop the liquid in the glass until the drink was drained, like the head on a Guinness. Ben was fascinated and mystified by it. I could only guess that all the plant matter that goes into a bottle of Angostura creates some really fine particles that somehow bind to the other ingredients and froth when shaken. I may be way off but, hey, it sounds good. Another bitter cocktail I tried recently and have to mention, because it’s every bit as bold in its own way as the Trinidad Sour, is the No. 47 at Hungry Mother (the cocktails here have numbers instead of names). The cocktails during my first two visits to this instantly acclaimed, year-old Cambridge restaurant were underwhelming. But this time around they were perfect. The ingredients in the No. 47 are Laird’s Applejack, Aperol and Buffalo Trace Bourbon — in what proportions I don’t know exactly, but none seemed overshadowed by another, and together they created a mixture that transcended the individual spirits. The drink was served “down” in a heavy rocks glass with a large sphere of ice, which made all the difference. The drink started out strong but stayed cold and balanced as the ice slowly melted. I thank bartenders Ned Greene and Duane Gorey, plus co-owner Alon Munzer, for creating Hungry Mother’s short but sweet cocktail menu and for adding some more delicious medicine to my first-aid kit. 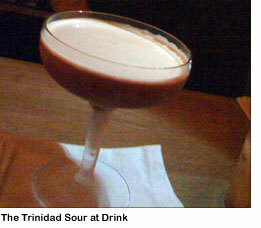 I’d heard about that Trinidad Sour (from Ben, I think), and it just sounded barking mad to me. I went to some trouble in my Weekly Dig bitters piece a couple of years back to limn the distinction between potable and non-potable: guess that’s out the window now! I’m also glad to hear about Hungry Mother’s cocktails improving. I wasn’t loving the early numbered cocktails myself, which tended toward sweetness in my book. Must give them another go. Ah, Fred, I was counting on you! Thanks for the recipe for the #47. I figured as much. And, since I saw you the night I had the Trinidad Sour, I figured you’d write about that, too — woot! Yes, the TS is cherry-y, isn’t it? And your pic is way better than mine. What else is new? Slim: Yeah, go back. Check out the cocktails. 1 oz barbancourt 8 year. Oops, I pressed enter before describing the recipe. I think I have the measurements correct. It’s Don’s Little Bitter from Don Lee at pdt. Ben made this for me last week. It was incredible. The Trinidad Sour comes to us from Giuseppe Gonzalez at the Clover Club. Gotta make sure we give props where they are due! Cheers Giuseppe! Boston hearts your cocktail! Just want to add to the praise for Giuseppe, who doesn’t just make great drinks, he’s the full package as a bartender and will make you feel right at home. I recommend anyone who is in New York stop by Clover Club and enjoy what he does! Thanks for all the info, tips and recipes, people! Wow, DoubleMan, that recipe should be called the WTF. i have this and it is very off-putting to think about, but soooo good. I just ran out of orgeat a couple of nights ago, but I had everything needed for the Little Bitter posted by DoubleMan, so I just mixed it up… and I have to say, I’m shocked by how good it is. Layers upon layers of flavor but absolutely balanced as DoubleMan pointed out. This is a truly incredible drink. Prior to this, the Alabazam (http://spiritsandcocktails.wordpress.com/2008/09/16/alabazam/) with 1 teaspoon of Angostura bitters was the cocktail using the largest amount of bitters like this. Given that I love that one, I was not surprised to love the Trinidad Sour I just mixed up. Delicious – thank you for sharing! Any thoughts on a good Orgeat syrup? I saw and almost bought the Fee Bros the other day, but I imagine this crowd has some other ideas about brands. Also interested in thoughts on Falernum. MC: I’ve been using Ferrara brand “Orzata,” which is readily available in the Boston area. Pretty good stuff, and “artificial flavoring” is not listed anywhere on the ingredients label, which makes me happy. Drop in a bit of orange flower water, if you feel the need, for a more authentic orgeat flavor. I’ve also heard good things about Monin, but people on some of the tiki forums I’ve visited swear that Trader Vic’s brand is the best — I have not personally tried either, though. Thanks, Adam! Blanchard’s in Allston has both falernum and orgeat by Fee Brothers in quart bottles for around $6. I just stumbled across Cleve’s earlier comments in this forum saying that Fee’s falernum is good stuff, so I think I’ll go with that one. Cleve also recommends going to Italian stores for orgeat made without HFCS. The orange flower water idea is nice, and I already have some of that. I haven’t tried Fee’s falernum, but I own Taylor’s Velvet which I rather like (it’s boozy unlike Fee’s which is sugar based although a bit more expensive). I am guessing that an alcohol base/extraction is more authentic (Paul Clarke makes his with overproof rum). We use the Fee’s orgeat (easiest to find) but the Trinidad Sour made at Drink uses Ferrara. No clue about comparisons. Just after I posted here I happened to receive an Amazon gift certificate, which I used to order bottles of Monin and Teisseire orgeat. I’ll post back here once I do a side-by-side with those and Ferrara. By the way, due to shipping each of those bottles cost me (or my gift certificate) around $20, whereas Ferrara costs $6 at the Italian market down the street. So they’d better be damn good to win the challenge! I’m currently carrying the Fee’s Orgeat and Falernum at my store inside Grand. Not sure what’s on the shelves this second, but I try to keep both the 32 oz and the 12.8 oz of both in stock. This way you don’t need to buy a huge bottle just to try it. I can get them in even smaller bottles for travel or tasting if there was enough interest. Just drop me a note. Also – if there are brands of any items that folks really like, please let me know. I really try to stock the best I can and am always want to know what folks are enjoying. A) Bottle: The Teisseire bottle is made of thin metal that dents very easily. Minus. But it has a really nice pour spout. Minor plus. The Monin bottle is glass, which I prefer to the Ferrara plastic bottle. B) Ingredients: Monin is made with water, sugar, and almonds, and that’s it. Big, big plus. Teisseire adds “glucose-fructose syrup” (written in French — HFCS?). Minus. Ferrara adds artificial coloring, citric acid, and preservative. Big minus. C) Smell: Monin and Ferrara hands down over Teisseire. The two winners smell almost identical so I won’t go any further there. D) Taste, straight: Monin and Ferrara, again, hands down over the one-dimensional Teisseire. Both orgeats are complex and sightly tangy, the Ferrara just a tiny bit more so, but I might attribute that to the fact that I was aware that it contained citric acid as an additive. I liked them both equally well. E) Taste in a drink: Again, and not surprisingly, Monin and Ferrara win here too. I made three Trinidad Sours, one with each orgeat. The Teisseire version was overly bitter, and the orgeat was simply not rich enough to bring out the great hidden flavors of the Angostura. Monin and Ferrara performed more or less equally well, creating a smooth and delicious drink. As an aside, does anyone know if syrups without preservatives should be stored in the refrigerator? The Monin label says nothing about it, but I assume that sugar syrup can’t last long at room temperature if some bacteria finds its way in there. I’m still watching the thread, Adam. Thanks for documenting your tasting – it’s a huge help! I’ll look a bit more into carrying Monin locally. I know their Pomegranate is supposed to be excellent as well. Sub lime for the lemon and aged Trinidad rum for the rye and you have a Native Trinidad Sour (with very good effect, IMHO — the rum I’ve been using, Plantation Trinidad, really compliments the drink nicely). Drop the Angostura to 2/3 oz, add 1/3 oz Fee’s Whiskey Barrel Aged, drop the rye and instead use 3/4 oz applejack (bottled in bond, please), and you’ll end up with what I’ve dubbed the Trinidad-Jersey Sour. Intriguing, Adam. Thanks for sharing the results of your experimentation.